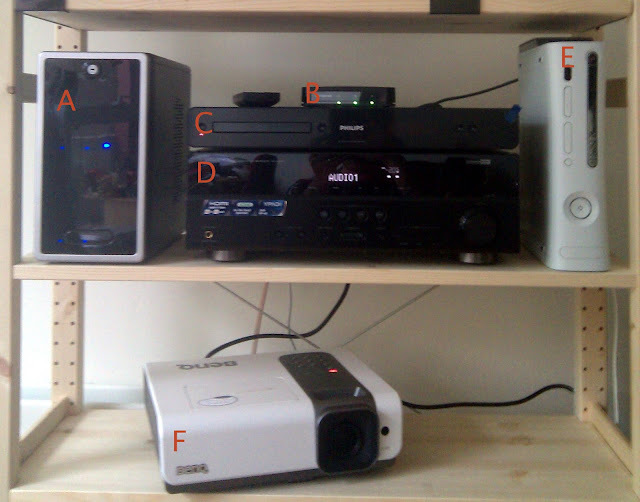 Recently, we embarked upon an update of our 'media center' / 'home theater' setup. Our projector had reached the end of its 2000 hour bulb life, and since it was a cheap projector to start, a replacement bulb would've cost nearly as much as the projector itself did a couple of years ago. Also, it's become extremely unreliable - 9 times out of 10, pressing the power button results in a brief flash of light from the bulb, followed by nothing. Plus, we promised ourselves that when the bulb ran out, we'd buy an HD projector, as they ought to be affordable by then. Well, that time has come, and we've done the upgrade. Since we were upgrading to HD, it seemed necessary to get an AV receiver that supports HDMI to replace our 2-channel amplifier and let us switch audio and video at the same time. And if we have that, we may as well get a blu-ray player, too - after all, they're pretty cheap now.